The Satank Bridge, is both the longest span timber truss bridge in the state, and also the last of the timber truss bridges still in use in Colorado. The original Satank Bridge project was awarded to the Pueblo Bridge Company on May 12, 1900. The 2010 Satank Bridge rehabilitation project involved lifting the original bridge from it’s base, structurally rehabilitating the trusses and decking, restoring the original sandstone masonry abutments, constructing rock wall retaining structures alongside the bridge abutments, and site restoration. 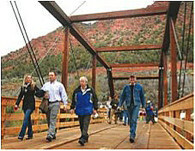 The bridge now sits in its original location where it will once again connect the north and south sides of the Roaring Fork River. Although it will not be used for motorized vehicles, it is a heavily used pedestrian and bike path that joins the Carbondale and Glenwood Springs communities.